So, tomorrow is Star Wars Day. 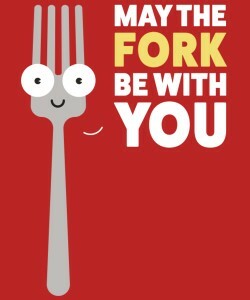 We’ll have a totally Star Wars related shirt then, but for today I just want to wish a fork to everyone. Because everyone deserves to eat with a good, sturdy fork. The Fork has a dark side (the pointy part) and a light side (the side you hold) and is in perfect balance to bring delicious food to your mouth. The Fork loves you, the Fork is there for you, the Fork is with you, you are one with the Fork. Wrap this cloth around your torso and use the Fork. Use it to drop that meatball down a ventilation shaft.